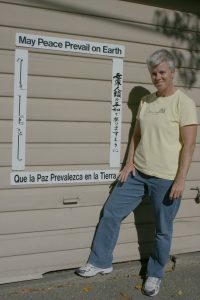 Tina Downey of Sacramento, California discovered yet another creative way to spread the message, May Peace Prevail on Earth. Tina has four (Peace Pole) language plates mounted on the side of her garage, proclaiming May Peace Prevail On Earth in English, Hebrew, Spanish and Japanese. Many people pass her garage on their way to the local hospital. She has seen people slow down and really contemplate what they are seeing.